Timothy Dyck // Blacksmith — Bench & Co.
On a rainy Saturday morning, I took a drive out to Abbotsford. My partner, Scott, made the trek with me. We had different objectives but we were both looking for something we’d never seen before. Scott was meeting up with a friend to go fishing for Steelhead. I was meeting up with Timothy Dyck to learn what a blacksmith does. Come to think of it, Scott and I were both searching for steel. The images I had in my mind of a blacksmith were mostly generated by Hollywood. I envisioned an old man standing in front of a furnace hammering on a sword or a horseshoe. Even from seeing images of Tim’s work, I had an inkling that I was on my way to see something much different. What I found was an artist pushing the boundaries of what's possible with his medium. Constantly looking to other artists and makers for inspiration, some of his techniques may be more familiar to glassblowers than blacksmiths. What first surprised me about Tim's studio was the size of it. This was not the tiny blacksmith's shed I'd seen on my elementary school field trip (granted that was essentially a reenactment from 1719). Towering pieces of equipment were scattered around two large workbenches. Heat was coming from a comparatively small contraption. I quickly learned that this piece of equipment, called a forge, was the heart of the shop. A flowerpot. I’m building three of them. For the past couple years, I’ve done a lot of work for this customer. He runs the horse-drawn tours in Stanley Park. I’ve done all the railings, fences and brass work at the departure location. A flowerpot is not what I expected to find on a blacksmith’s bench, but I think my idea of a blacksmith may be a little outdated. Can you tell me a bit about what blacksmithing is today? Actually, blacksmithing 30 or 40 years ago was almost dead. There were a handful of blacksmiths in the UK and they created an organization that’s been growing and is vibrant. There’s still a long way to go, but it’s great to be a part of that. Locally, the west coast of Canada has been very underexposed to blacksmithing. Particularly because we don’t have the level of historical architecture that European cities do, there are elements of blacksmithing, such as ornate architectural elements, that aren’t needed here. It gives us an opportunity to create our own platform and I’m really excited to see how the craft grows. When did you first become interested in blacksmithing? I was 13. We were learning about the Medieval Period. I got this book from the library and there was a diagram of chainmail. I thought, well that’s pretty cool – I should try to make that. It sort of consumed me for the summer. How did that summer turn into a more serious interest? After making chainmail, I started getting into blacksmithing. The cool thing about blacksmithing is that if you want to get into it, you don’t have to jump in really hard at first. To make my first forge, all I needed was a $5 fan, an old brake drum from a truck, and some clay for the ditch. Forging is the process of working with the steel while it’s in a semi-molten state. Thirteen seems like a young age to be developing a skill like forging. Did you spend all of your free time in the shop? I had an incredible opportunity because I was homeschooled for most of my childhood. If I worked hard and got all of my schoolwork done in the morning, I could go and forge things for the rest of the day. That was a dynamic that I learned quickly: work hard and you get to do what love. It also allowed me to really push into the skills at a young age. After high school, I got an opportunity to do an apprenticeship with a blacksmith near the Rockies. He really pushed me through training. The schedule was 8am-2pm with him and then 3pm-10pm in trades welding school. I did those 14 hour days for two years. Even during that, I never questioned that this is what I want to be doing. What are the primary tools that you use? My shop has two main areas: forging and general assembly. Each piece of equipment has a history, and I make most of my own tools. The forge is the heart of my shop. It’s fueled by propane and runs at about 2,400 degrees Fahrenheit. I can melt steel in it if I have to. Nearby is my anvil, which is iconic and indispensable. It’s ridiculous how many options are rolled into this one tool. I found this one on a guy’s property with my parents when I was a kid. We decided to go talk to him and found out that it had been his dad's. I was so excited to find out that he was open to selling it. It’s about 100 years old. I have two power hammers. They’re an extension of what I can do physically by myself. Half an hour of me swinging a hammer is essentially equivalent to one blow from one of these. The larger of the two isn’t quite set up yet. It was originally from Buffalo, New York. It also has Chevrolet noted on it. Somehow it ended up in a Canadian mine and then around Vancouver. It’s 11,000lbs, which is pretty heavy, especially when you think about all of the traveling it has done. In the fabrication area, the tables are my primary tools. They’re about five inches thick and have holes in them to keep handheld tools in place. I’ve also got a flypress. It’s about 100 years old but is still made today – by the same company, with the same design. It’s used to manipulate the steel. Right now it’s set up with some tooling that I made. The lathe is used for metal spinning. This one actually came off of a Russian ship from the 60’s and I can’t even read it because it’s all in Russian and metric. Sometimes I just have to pull the knobs and hope for the best. Its stocky style is rare but it works out really well for what I make and it runs beautifully. What did you originally make and how has that progressed over the years? When I started, I realized quickly that I don’t particularly enjoy making blades. 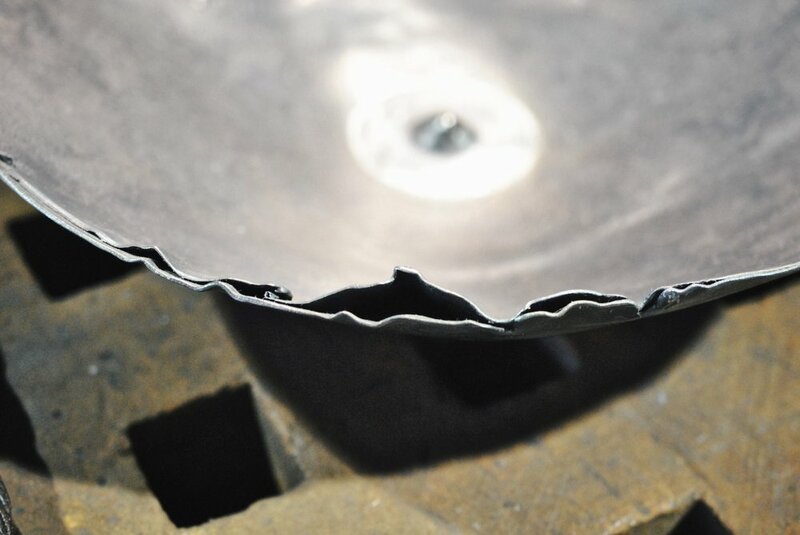 When you’re making blades, only a small portion of time is forging and the rest is filing and grinding and fitting. I still have a love for knives and I have an incredible appreciation for people who do that, but I knew it wasn’t the way I wanted to go because I wanted to forge. I’ve always said that I wanted to be an architectural blacksmith. 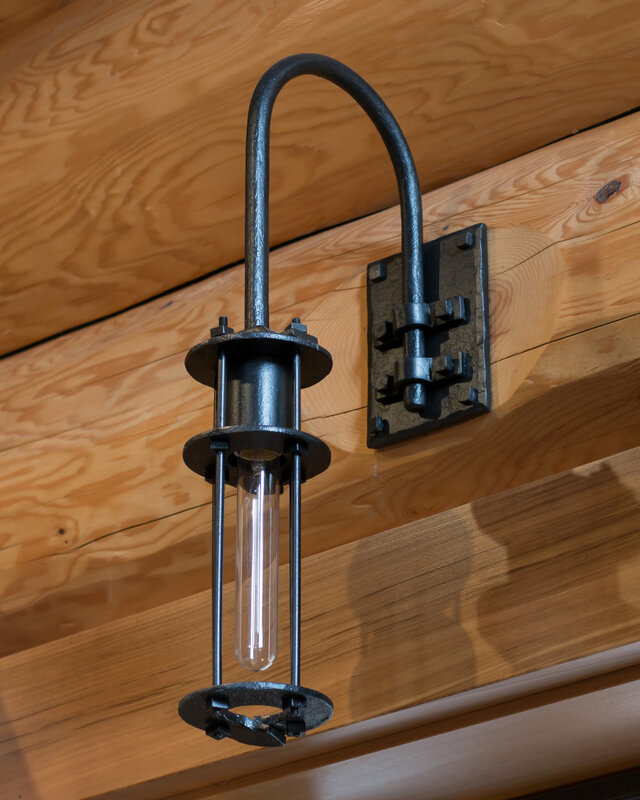 Typically that means an emphasis on forged work in an application of architectural elements such as railings, light fixtures, stairs, fireplace work, gates, etc. It’s vague but I’ve always been happy with that because it’s a cool opportunity to work with people to figure out what’s possible with steel. Over the past year I’ve been driving into the question, “What works for you, Tim, and why does it work for you?” At this point, it’s not so much about what I make but how I make it. The other aspects that have been really important to me are the tools and materials involved. Some of the work I’m doing right now is with old steel. I’m really enjoying that. I’ve always been interested in old steel. I’ve seen a collection of bowls on your website and see a few here on your workbench. Can you tell me about those? This is actually the work that I’m most delighted with lately. Basically, I have two different types of bowls in various sizes: one is made from new steel and one is made from old steel. The ones made from new steel have a pristine, contemporary look that’s often confused for ceramic. The vision for utilizing old steel was to take material that had a rich history and bring it into blacksmithing. What are you enjoying most about your work with the bowls? With forging, you can take old materials and make them into something else. Some of the bowls are actually made from steel cable that was part of an old logging bridge. I take about 10 feet of it, cut it into sections, and then heat it up to a semi-molten state. This is where the art comes in – I use a super old blacksmithing technique called fire welding. Not very many people do it today; it’s really challenging and fun. I get this piece to a semi-molten state and then forge it under the power hammer by hand, turning it into one piece of steel. Then I put all of the pieces together in a bundle, fire-weld it again, and flatten it out. From the flat state, I actually spin the bowls free-form. The inspiration for this technique came from glassblowers. Their material is similar in that it’s rigid when it’s cold but pliable when it’s hot. I have to watch the material closely as I’m working with it, almost like a clay sculptor. Imperfections in the finished bowl are from the two layers coming together and then opening up. I find this completely fascinating. The flattening and the spinning processes are playing off of each other for a result that you can’t get any other way. I haven’t seen anyone approach this with the same process yet, which is exciting for me. The details on these bowls are fascinating. I can see why they’re often confused for ceramic. If I didn’t pick them up and feel their weight I would’ve thought they were ceramic, too. In blacksmithing we always hit things, meaning they get contact with two surfaces. The result of this is those imperfections or hammer marks on both sides. What’s crazy about the concept of this process is, because I’m spinning these, one side is completely untouched. That’s how you get that incredible smoothness to one side. That’s where you start to get that the confusion between ceramic and steel. I love how the different sized bowls nest together. Was that purposeful? This shape in the middle is a byproduct of the machine, which makes them fit together perfectly as a set. It’s a nice detail. The form of the bowls is so delicate. The contrast of that with the strength of steel is inspiring. They appear fragile but I imagine they’re quite sturdy. We only recognize steel as a rigid and strong material. It is, but there's more to steel then that. The amazing thing about forging steel is that, once it’s heated up, it becomes pliable much like how clay moves. As a blacksmith I shape and fashion it in this state. Once cooled, the effects of shaping while hot are frozen forever. The bowls look fragile and light, because of this process, but rest assured they will be around for as long as you want them to be. The finish on them is really progressive. It’s essentially an oxidized finish, which means it’s controlled rust. But it’s controlled in a ridiculous environment, resulting in a semi-hard surface. It’s really durable, similar to stainless steel. The bowls are the start of me exploring where I want to go with my work. I don’t know what that looks like yet. My work schedule with architectural jobs varies, but if I had my choice I would focus on the new work all day long. I’ve never had a split like this so much in myself before. It’s interesting to see how I’m changing my craft. The longer that I’m into it, I look less at blacksmiths for inspiration. I feel like I gain more from looking at other makers and artists. I think it’s great to look at other artists in other mediums. Not only did I get a tour of Tim's entire studio and learn how he came to be a blacksmith, I also saw his process first hand. Before I left, he heated up a steel bearing, hammered it into a spherical shape, and punched a recess about two inches in diameter into it. After cooling it off and coating it with beeswax, he handed it to me. It's now my favourite, and heaviest, candleholder. Scott didn't end up catching any fish, but even if he had I still would've come home with the better catch. To see videos of Tim making the candleholder, check out the "Studio Visits" stories on the Bench & Co. Instagram. To get in touch with Tim and see more of his work, visit timothydyck.com.